Ok. I’m gonna try this. 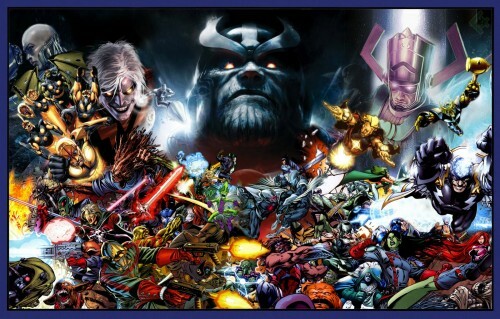 Thanos, magus, galactus, silver surfer, moondragon, nova and the nova corp, groot, bug, martyr, rocket racoon, cosmo, starlord, drax, major victory, gladiator, warlock, impossible man, mantis, triton, gorgon, darkhawk, talon, lockjaw, karnak, gamora, ronan, ch’od, havok, polaris, quasar, korvus, beta ray bill, black bolt, medusa, phoenix, I think that’s it. The only guy I don’t know is the guy under thanos chin on the left fighting korvus.